Transformational coaching by a person who has personally experienced transformation and has mastered a specific coaching methodology is a powerful catalyst for holistic change. The transformational coach can awaken individuals and groups to greater awareness and a sense of purpose that enables them to move through these barriers and access untapped sources of energy for breakthrough potential. 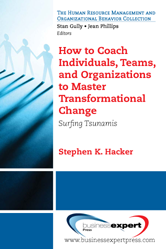 This book offers a practical yet provocative approach and gives coaches, organizational and business leaders, HR executives, and other change agents a proven approach for creating transformative change on an individual and collective scale by first coaching themselves and then other individuals, their teams, and their organizations for significant improvements in performance and effectiveness. This is a hopeful book that envisions individuals bringing their whole selves to work; work as an act of co-creation among everyone in the organization; and organizations deepening their connection to their employees, stakeholders and partners, and society as a whole. The book's unique contributions to the field of individual and collective transformation in the workplace are built on three central ideas: Radical improvement is possible only through a transformation rooted in expanding consciousness and integrating the body, mind, and spirit. Purpose and vision can then be drawn from deeper wisdom and fueled from a larger source of creative energy, spirit-generated creativity. Radical improvement in collective performance is not a top-down phenomenon. Rather it hinges upon the individual members embracing transformation in their own lives and finding alignment between their and the group's purpose, vision, and values Radical improvement can be implemented, sustained, and repeated if it is pursued through a holistic, systematic, yet practical framework that also incorporates solid processes for planning and implementing change and measuring results.